Keeps tools organized and right on hand! No more searching through the tool box for the bit you need- it's clearly visible with the tool collector! Swings out of the way when not in use. Also a great place to keep that cup of coffee! Well named because I seem to collect a lot of tools to use on my drill presses. Bought another press so needed one for it. When my old Canadian Made Rockwell-Delta Model 15 Drill Press turned 41 years old I decided it deserved a Birth Day Gift. The oldest stationary power tool in my shop, purchased in 1978, says "Thank You, Rockler, for the Wonderful Gift". Already had one and liked it so much I ordered another. Very handy tool. Simple to install - Great product ! This is a must for anyone with a Drill Press! Easy to instal and really simplifies life at the drill press. Works perfect. Does what I need it too. i like it very much so far. helps me organize my tools and other related pieces. This is a very handy item. I have always walked back and forth from my drill press to the drill press while drilling holes. This tool holder allows me to drill and exchange bits more efficiently by having everything I need within easy reach. I will be getting a similar one for my midi lathe next. Nice tray, exactly what I needed! Very convinient for my needs. I saw this on-line and immediately ordered it. the price was right and it comes in handy. had 1 b4, great item!! keeps everything u need in reach. Will fit nicely on my Shopsmith, especially since there is room on it for a cup of coffee. The tool collector was exactly what I needed to add to my new drill press. It rotates out of the way nicely and can be easily removed and reinstalled as necessary. I have been wanting one of these all along. The ale rice just sealed the deal on this item. Works great with my floor-standing drill press having 4 times the space. This was a great addition to my Jet drill press. When using the press I find I'm always switching between bits and generally have small this around on the drill press table. This tool collector is great for keeping things handy but not always falling off the drill press table into the shavings etc. on the floor. If you work in a shop very much you're gonna have to use the drill press once in a while and this product is a must. It saves you time and you can find what you need to operate the press because it's right there in front of you. Thanks for a great product. Great product! Can now find the chuck key all the time. Very very easy to install and functional it just adds that extra little touch that makes being in the garage great! The table is free to swing around the column, which kind of bugs me. I mounted mine above the rack, which makes it a little high. Probably need to try mounting it "on" the rack, which would make the height more comfortable for me. But, other than that, it is pretty handy and yes, I would buy another one. 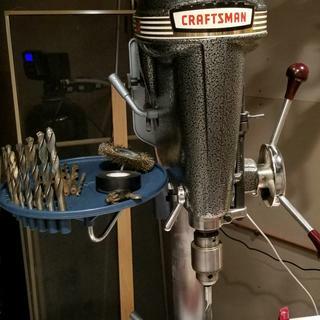 I have had this for a few months, I was very pleased wih it, sure saves time when huting something I need at the drill press. It's a shelf for on your drill press. It cannot be that impressive. Not bad though!!! With the on sale price, it less expensive than the time it takes to make something similar. It's very functional, that extra horizontal storage space at the right height is quite useful. A convenient accessory. The mounting design is clearly intended for a drill stand column greater than 3&quot; in diameter. My Craftsman bench drill press has closer to a 2&quot; diameter and the bracket and strap are oversized. Trimming the strap and adding a block to the side of the column allows a to be cinched down tightly. Requires clamping a plastic table bracket to your drill press column with a screw clamp like a radiator or dust hose clamp. My drill press is a Delta unit that has a crank to elevate the cast iron table and includes a steel rack for the elevating crank that swivels when the drill press table is rotated around the column. Use of this product locks the elevation rack and precludes swiveling the regular drill press table out of the way for tall work pieces. Used the product anyway as it appeared to be a useful accessory, but after a few weeks, the plastic table bracket holding bracket cracked and the table fell off the drill press column. Good product idea, less that perfect implementation. The plate arrived in a warped condition. It is ot level and it seems as though the whole form was faulty. 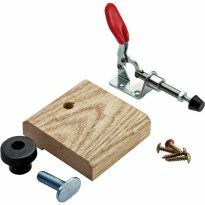 I have yet to talk with Rockler, but hope they will replace it.Editor's note: Yes Ron, a call to out customer service with your order info and they will arrange to replace for you. To save space on my drill press -- never have enough room. The magnet on the side of my drill press isn't enough. I wanted somewhere to put my commonly used accessories, ie t-track hold downs, bits, collet lock, etc. 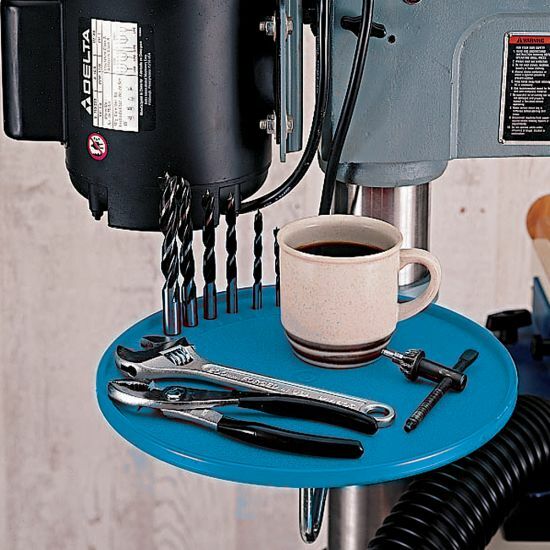 A great place for all those essentials for the drill press. Coffee cup needs a home doesn't it? Well designed to work well with the drill press. It's just the right size and color for my drill press. Doesn't take up too much space, but provides a good amount of storage/access to drill press. I believe it will be a useful addition to my drill press. Beats putting items on the work bench. Need a place on drill press so tools are at hand and don't fall on floor. For the price and functionality very appropriate to manage bits and chuck. Great idea for my drill press. Had an old one similar, and it broke, after about 20 years. A great place for the items your own picture shows. Convenient! I have one and I love it but I broke it, so I am getting another, it is nice to have something on the press that you can put stuff that is out of the way and you can move out of the way also, it is very nice to use and easy to install. Needed a tray for my press. I have been happy with other items I have purchased or received as gifts. How does this mount to the drill press? There should be a picture showing the mount. BEST ANSWER: It mounts with two 3" clamps (hose clamps) that tighten around the large shaft of the drill press. It has a metal strap that connects it to the pole. I chose to use two zip ties in case I need to lower my shopsmith back in to horizontal mode. Hope that helps. It is a great tray and well worth the price. I love the little holes to help hold the bits when not in use. It is a stainless hose clamp style mount. You can either attach it above the rack, or there is a groove on the mount which can straddle the rack.